1940s: A young Frank Sinatra in a CBS studio. The screaming, adoring fans seen on the Ed Sullivan television show when Elvis Presley performed there in the 1950s, or when The Beatles appeared on the same show in 1964, weren’t the first such displays of fan hysteria for music stars. In the early 1940s, as radio and recordings were making singers more broadly popular, it became clear they could also draw huge, adoring crowds to their live performances. 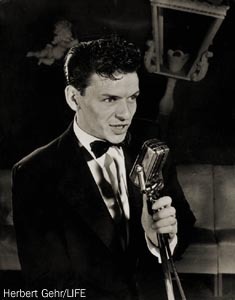 And one of the first modern “teen idols” to do just that was a young singer from Hoboken, New Jersey named Frank Sinatra. New York fans mob Sinatra, 1943. In fact, Sinatra’s vast appeal to this group revealed a whole new demographic for popular music and for marketing. Sponsors had yet to recognize the vast economic buying power of teenagers and young adults, and had traditionally aimed their programming and sponsorship at the 30-to-50-year-olds. But that soon changed. 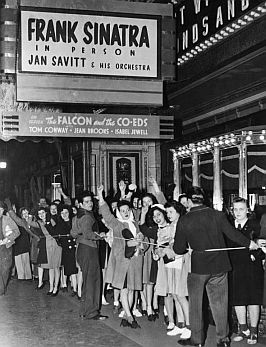 On December 30,1942, when Sinatra played his first solo concert at New York city’s Paramount Theater near Times Square, the Bobbysoxers came out in droves. After being introduced by Jack Benny, Sinatra walked on stage to loud and continuous shrieks and screams. “The sound that greeted me,” he later recalled, “was absolutely deafening. It was a tremendous roar. Five thousand kids, stamping, yelling, screaming, applauding. I was scared stiff. I couldn’t move a muscle. [Band leader] Benny Goodman froze, too. He was so scared he turned around, looked at the audience and said, ‘What the hell is that?’ I burst out laughing.” The kids screamed in delight; some even fainted. They also crowded the back stage door after the show shrieking for his autograph, and spilled over into Times Square, snarling traffic. Sinatra by then had become a recording sensation. He was so popular at the Paramount, that his engagement there was extended to February 1943. He played the Paramount for nearly four solid weeks, first with Goodman and then an orchestra led by Johnny Long“Not since the days of . . . Valentino has American womanhood made such unabashed public love to an entertainer.” –Time, 1943. But Sinatra’s drawing power was real, and so was his talent. Between 1940 and early 1943 he had 23 top ten singles on the new Billboard music chart. And all through those years, back at Paramount and other venues, the kids continued screaming and swooning for Sinatra. “In various manifestations, this sort of thing has been going on all over America the last few months,” wrote one Time reporter who had observed Sinatra’s screaming kids at a July 1943 Paramount performance. “Not since the days of Rudolph Valentino has American womanhood made such unabashed public love to an entertainer.” Fans had not swooned or screamed over other singers, such as Bing Crosby. So what was it with Sinatra? Something else was going on, the critics surmised. Although his singing was certainly a factor, some charged it was also Sinatra’s look; his seeming innocence, frailty, and vulnerability that evoked the passions of female fans. Newsweek magazine then viewed the Bobbysoxer phenomenon as a kind of madness; a mass sexual delirium. Some even called the girls immoral or juvenile delinquents. But most simply saw them as young girls letting their emotions fly. 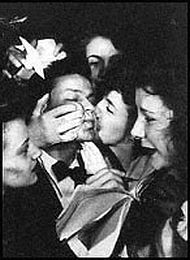 Still, Sinatra fan clubs were cropping up all over America, and not just among teenagers; 40 year-old women were enlisting too. New York Times story of August 3,1943 on Sinatra appearance with the New York Philarmonic for a night of pop singing at Lewisohn Stadium at City College. In early August 1943, Sinatra played in New York city at City College with the New York Philharmonic, where a contingent of his fans showed up adding their boisterous approval. In California, the announcement of Sinatra’s slated appearance for a mid- August 1943 show at the Hollywood Bowl “had thrown Los Angeles high-brow music lovers into a self-righteous williwaw,” reported one account in Time magazine. 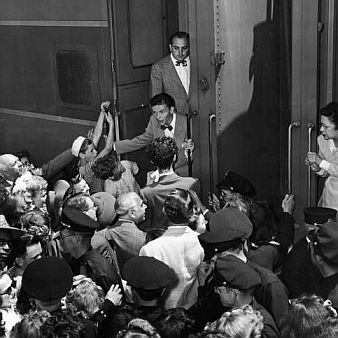 When Sinatra arrived by train at the Pasadena station, his fans went “into a squealing ecstasy,” according to Time magazine. But Sinatra’s symphonic debut at the Bowl was relatively calm. “As he led into ‘Dancing in the Dark,’only a self-conscious handful of female fans whinnied ‘Oh Frankie!’,”reported Time. “Halfheartedly, the press photographers posed a couple of shots of Hollywood babes ‘rushing’ an accommodating cop or two.” Sinatra had drawn the biggest Hollywood Bowl crowd of that season, fattening the gate and no doubt pleasing his hosts. Sinatra also appeared elsewhere across the country that year on a national tour, including Pittsburgh, Pennsylvania, where he appeared in December 1943 with Philadelphia band leader, Jan Savitt and his Top Hatters. Frank Sinatra being greeted by fans at Pasadena, CA train station, August 1943. In October 1944, when Sinatra returned to New York city’s Paramount Theater –and by then he had also appeared in the films, Step Lively and Higher and Higher — some 30,000 to 35,000 fans, mostly female teens, caused a giant commotion outside the theater. Dubbed “The Columbus Day Riot,” the police were called in to diffuse the situation. Part of the problem had to do with fans who refused to leave the theater after having seen one complete show. Repeat performances were then being scheduled in tight rotation, running nearly all day and into the night. In theaters with a capacity for 3,000 to 3,500 fans, sometimes as few as 250 would leave at the show’s end. Some were known to sit through dozens of performances to the point of becoming faint, remaining in their seats for six or eight hours without food and refusing to leave until forcibly removed by attendants. Frank Sinatra fans waiting on line, Pittsburgh, PA, December 11th, 1943. Sinatra, meanwhile, was becoming a rich young man. Between October 1942, and mid-1943, he made an estimated $100,000 from radio, film, and personal appearances — a huge amount of money in those days. His adoring teen audience would prove to be something of a guaranteed market in the years ahead; an audience that would literally grow up with him, being roughly of the same age. They would follow his music and career as he aged, thus assuring Sinatra and his sponsors a continuing future audience. In the fall of 1944, Sinatra’s fame brought him into his first round of “up-close-and-personal” politics, meeting with President Franklin Roosevelt in September. Sinatra publicly supported the president’s re-election bid that October. In New York city, Sinatra’s young fans came out in some numbers to hear a late October speech he made on behalf of Roosevelt at Carnegie Hall. Sinatra also campaigned for Roosevelt in November 1944. Frank Sinatra by then had also entered the business world, setting up a music publishing business. But out on the concert circuit, and in the sale of his recordings, Sinatra’s singing continued to enthrall millions of teenagers and young adults. 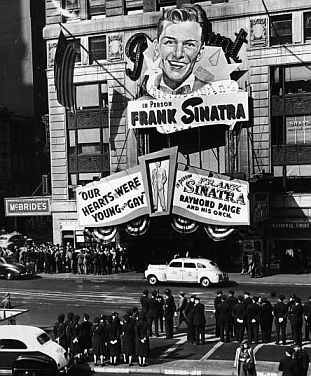 Frank Sinatra giant marquee at New York's Paramount Theater, October 1944. (photo - Hulton Archive/Getty Images). “. . . The United States is now in the midst of one of those remarkable phenomena of mass hysteria which occur from time to time on this side of the Atlantic. Mr. Frank Sinatra, an amiable young singer of popular songs, is inspiring extraordinary personal devotion on the part of many thousands of young people, and particularly young girls between the ages of, say, twelve and eighteen. The adulation bestowed upon him is similar to that lavished upon Colonel Lindbergh fifteen years ago, Rudolph Valentino a few years earlier, or Admiral Dewey, the hero of Manila Bay, at the turn of the century.Mr. Sinatra has to be guarded by police whenever he appears in public. Indeed, during the late political campaign he broke up a demonstration for Governor Dewey, the Republican candidate, merely by presenting himself on the sidelines as a spectator. . . .
Frank Sinatra, 1943 Life magazine photo. By 1946 Frank Sinatra’s recording company, Columbia, estimated that he was selling 10 million records per year. Yet these were still the early years for Frank Sinatra. He had another 40-plus years of performing and music-making ahead. A 1972 six-disc, boxed set of the early Frank Sinatra-Tommy Dorsey years, RCA-UK, vinyl LPs. 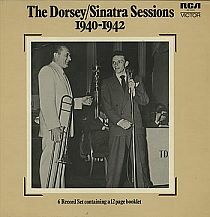 CD cover of 1940s Frank Sinatra-Tommy Dorsey recordings, 2005. “That Old Sweet Song,” Time, Monday, July 5, 1943. “Symphonic Sinatra,” Time, Monday, August 23, 1943. “Frank Sinatra Sings to 7,000 at Stadium; Heard With the Philharmonic – Steiner Music Played,” New York Times, Wednesday, August 4, 1943, p. 14. “Sinatra Fans Pose Two Police Problems And Not the Less Serious Involves Truancy,” New York Times, October 13, 1944. “Youngsters Flock to Sinatra Speech; Overflow Crowd Hears Singer Urge Roosevelt Re-election at Carnegie Hall,” New York Times, Wednesday, October 25, 1944, p. 16. “Biography of Frank Sinatra,” About the Artist, The John F. Kennedy Center for the Performing Arts, Washington, D.C.
“Frank Sinatra and The ‘Bobby-Soxers’,” Guardian Unlimited (London), New York correspondent, Wednesday, January 10, 1945. “The Life of Frank Sinatra, Part 2,” Originally written and compiled by Gary Cadwallader for Seaside Music Theatre and MaryAnn Eifert for research materials, posted at Summer Wind Productions.com, March 2008. “Frank Sinatra” and “1943 in Music,” at Wikipedia.org. Antony Summers and Robbyn Swan, Sinatra: The Life, New York: Doubleday, 2005.